We often serve these muffins when our savory breakfast entree is a southwestern style frittata garnished with avocado, sour cream and salsa or an omelet with smoked ham and cheddar. Mix together flour, corn meal, baking powder, salt and sugar. In a separate bowl, add soda to sour cream and stir until frothy. Add beaten eggs and milk to sour cream mixture and mix. Add sour cream mixture slowly to dry ingredients and stir just until blended. Fold in 1 3/4 cup of the cheese and the dill. 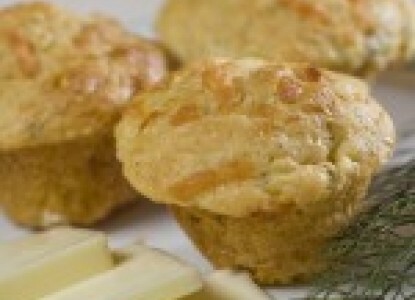 Fill 24 greased muffin pans about 2/3 full and top with remaining cheddar cheese. Bake in a preheated oven about 25 minutes or until nicely browned.